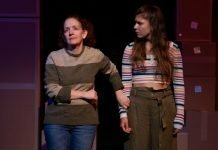 Kyra Zagorsky as Emily and Patrick Sabongui as Amir in the Arts Club Theatre Company production of Disgraced. Photo by David Cooper. Talk about relevance. As the Conservative Party of Canada continues to feed the fears of a nation, the najib debate rages, and we continue to heal over the terrorist attacks on our own soil, the Arts Club Theatre Company presents Ayad Akhtar’s smart, but always accessible, Disgraced. Refreshingly accessible with a tension-filled slow burn, the real power in Disgraced comes long after the curtain falls. This one will no doubt make for some heated conversations around the dinner table. On second thought, maybe that isn’t such a good idea. Amir and his wife Emily lead a privileged life; he a rising star in his company’s law firm, and she on the verge of a breakthrough in the art world. When Amir’s comfortable life comes crumbling down around him, as his denial of his roots and religion are revealed, the personal and professional consequences are huge. A slow burn, there is a tension that Akhtar begins to build immediately in this quick 80 minute play. You know that things are not going to necessarily end well, but Akhtar takes his time to peel back the layers of that looming devastation, not unlike the best horror movie. For all its tension though, Akhtar uses a generous sprinkling of humour to help release the pressure. Interestingly enough though, at least on opening night, some of the laughter early-on came at seemingly inappropriate times. Perhaps it is was a reaction to some of the uncomfortable subject matter, but it was also somewhat disturbing, serving to emphasize our collective fear of what we don’t understand. In shows of this kind, with their exploration of some rather heady topics, playwrights always run the risk of either talking down to their audience, or getting so intellectual that it simply flies over our heads. Akhtar has managed to find that perfect balance which makes every argument land with an equal amount of understanding and power. Not surprising though, coming from a playwright that invokes a South Park reference to make a comparison between Mormonism and Islam. But even as Akhtar tackles religion, politics and cultural expropriation, there is a central question that swirls around Amir: how much of the denial of his heritage is a mechanism to mask how he really feels? This is where the power of Disgraced really lies, and a theme that resonates well beyond the discussion of religious extremism. 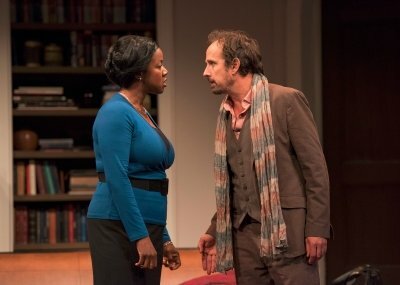 Marci T. House and Robert Moloney in a scene from the Arts Club production of Disgraced. Photo by David Cooper. Leading this terrific cast is a brilliantly subtle performance from Arts Club newcomer Patrick Sabongui as Amir. It is difficult not to take your eyes off him as he builds to a crescendo, and is equally deflated in the aftermath. The hope though is that his subtlety plays to the back of the Stanley Theatre, as it is one of the best things about this production. The rest of the cast are equally compelling. Kyra Zagorsky, as Amir’s wife Emily, is a perfect match for Sabongui as she pushes him to places he does not want to go. Reaching the conclusion that her artwork is cultural appropriation comes across as genuine, and not simply as another message from the playwright. Marci T. House gives a wonderful performance as Amir’s friend and co-worker. Walking that fine dinner conversation line between what is acceptable and what is not, there is also a delicious irony that may very well have you thinking of Stanley Kramer’s 1967 film Guess Who’s Coming to Dinner. As her husband, Arts Club veteran Robert Moloney brings a casual ease to his role that delivers big time in the more explosive scenes. Conor Wylie makes the most of his small role as the young nephew who perhaps sees the most dramatic change. Director Janet Wright makes good use of Ted Roberts’ realistic set, and costume designer Barbara Clayden goes all out with some beautiful suits for Sabongui, gorgeous fitting dresses for Zagorsky, and appropriate artistic frumpiness for Moloney. Disgraced by Ayad Akhtar. Directed by Janet Wright. An Arts Club Theatre Company production. On stage at the Stanley Industrial Alliance Stage (2750 Granville St, Vancouver) until October 18. Visit http://artsclub.com for tickets and information.